Have you ever heard of the iPhone? If not...we need to talk. No, seriously. But if you are of this planet and do indeed own one...you may find this app to be interesting, especially our wedding planner friends and those planning their own big day. It's called "iWedding Deluxe". It allows you to further manage the day to day details. It includes seamless integration with your contacts, a customizable To-do list and the ability to manage your finances, seating, music and gift registries for the event. It's broken down by modules so you can utilize only those that you need, while providing the ability to create your own. It also integrates TweetPhoto, allowing you to post photos to Twitter. I was a bit hesitant to provide info for this app since I haven't used it myself, so buyer beware..but I have heard very positive reviews. It is slightly more expensive than your typical $0.99 app. You can find it today at the App Store for $9.99. 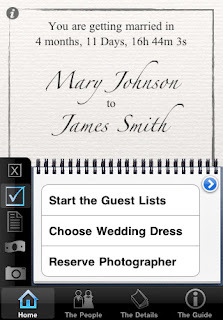 There are number of app are available for the wedding planning help. 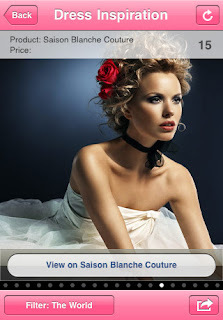 It is the engaged people has responsibility to find the perfect and suitable wedding app for their wedding.